Use Office, sales, display, etc. Landlord is the owner of ________, an office, research and development and distribution park located in ___________ County, ___________ ("Property"). Landlord and Tenant have agreed that Landlord shall lease to Tenant and Tenant shall lease from Landlord certain space at __________________, ___________ and have agreed to enter into this Lease to evidence the term and conditions of the leasing of space by Landlord to Tenant. Approximately __________________ (______) SQUARE FEET (as measured from the centerline of all demising and exterior walls) of space located in the building located at __________________, ___________ (such building in the lot or lots in which is located collectively, hereinafter referred to as the "Building") in _________, ___________ County, ___________. The location of the Demised Premises within the Building shall be as shown on EXHIBIT A attached hereto and hereby made a part hereof. Subject in all respects to the terms, limitations, conditions and agreements contained herein, the term of this Lease (herein referred to as the "Term") shall commence on the earlier of the date that the Tenant takes possession of any part of the Demised Premises or __________provided that the Demised Premises are "ready for occupancy" (as defined in Section 3.03 below), whichever first occurs, and shall terminate (unless extended as herein provided) at midnight on ______________. Landlord and Tenant each agrees to sign a statement confirming the actual date on which the Term begins (herein referred to as the "Commencement Date") as soon as it is determined. If Tenant remains in possession of the Demised Premises after the end of the Term or any renewal or extension thereof with Landlord's consent but without a new lease reduced to writing and duly executed, Tenant shall be deemed to be occupying the Demised Premises as a tenant from month-to-month only, but otherwise subject to all the covenants, conditions, and agreements of this Lease. Subject to the general limitations of Section 4.01 and to the terms, limitations, conditions and agreements contained herein, Tenant may use the Demised Premises for the following purposes but for none other without Landlord's prior written consent: offices, sales, display, storage, service, repair and use of Tenant's products and equipment, engineering, training of Tenant's customers and employees for a computer, office electronics and telecommunications company. For the first twelve full months, _____________________ DOLLARS ($_________) (hereinafter referred to as the "Monthly Minimum Rent"). For the next TWELVE months, _____________________ DOLLARS ($_________) (hereinafter referred to as an "Adjusted Monthly Minimum Rent"). Such Monthly Minimum Rent or the Adjusted Monthly Minimum Rents, together with any Additional Rents then due as specified in Article 2 of this Lease, shall be payable on or before the first day of each calendar month during the Term of this Lease. If the Term commences on any day other than of the first day of a calendar month then, in lieu of the Minimum Monthly Rent specified above, the Tenant shall pay for the initial partial month (being the period from the Commencement Date until the end of that month) a prorated Monthly Minimum Rent computed based upon the Monthly Minimum Rent specified above prorated for the number of days during such period. Landlord acknowledges receipt of the sum of ___________________ DOLLARS ($_________). Landlord shall retain such sum as security for the performance by Tenant of each of its obligations hereunder, and it shall be referred to thereafter as the "Security Deposit". Such Security Deposit shall be held, applied and refunded in the manner and subject to the conditions hereinafter provided. No Monthly Minimum Rent shall be due for the first three weeks from the Commencement Date (the "Abatement Period"). Tenant shall not be obligated to pay any Additional Rent (as defined in Article 2) on the Demised Premises during the Abatement Period. During the Abatement Period, all terms and conditions of this Lease, except for payment of Monthly Minimum Rent and Additional Rent, shall apply to Tenant's use and occupancy of the Demised Premises. SECTION 2.01 - THIS SECTION HAS BEEN INTENTIONALLY DELETED. The Tenant agrees to pay to Landlord, as Additional Rent, each year, Tenant's proportionate share of any Direct Expenses incurred by or accrued as an expense of Landlord or its agents on account of the operation or maintenance of the Building and all appurtenances thereto and including a portion of any charges attributable to Common Areas, as hereinafter defined, and an allocable portion of any and all other charges incurred by or accrued as an expense of Landlord in connection with the operation or maintenance of the Building; provided, however in the cases of expenses which benefit portions of ____________ Business Park other than the Building, the portion allocated to the Building shall be based upon sound accounting principles adopted by the Landlord for the purpose of making a reasonable allocation. Attached hereto as EXHIBIT B is the estimated _____ Direct Expenses for the Building. Tenant's proportionate share of the total of all Direct Expenses allocable to the Building shall be calculated by dividing the total square feet of the Demised Premises stated at Section 1.01 hereof by an amount which is equal to the total net rentable square feet of the Building. It is agreed that the net rentable square feet of the Building is _____________________ (_____) SQUARE FEET. Notwithstanding the foregoing, in the event the usage of any utility, equipment or other Direct Expense by Tenant shall be determined by Landlord to be disproportionate to the amount of space leased by Tenant, the Landlord reserves the right to make an allocation of such Direct Expense to Tenant based upon actual usage by Tenant, as reasonably determined by the Landlord. Tenant agrees to pay such specially allocated amount in the event Landlord determines such usage is disproportionate and so advises Tenant. The term "Direct Expense" as used herein, shall include all direct costs of operation and maintenance as determined by Generally Accepted Accounting Principles (GAAP) and shall include without limitation the following: building supplies; ad valorem real and personal property taxes and other governmental charges; utility and service charges attributable to Common Areas or paid by Landlord; property, casualty, liability and other insurance premiums; repairs, reserves for major repairs, maintenance and service contracts for the Building, Common Areas and all related mechanical equipment; property management charges; grounds maintenance, security, removal of snow and ice, parking maintenance and striping, landscaping; and all other similar costs and expenses. If the State of ___________ or any political subdivision thereof or any governmental or governmental authority having jurisdiction over the Building, should specifically impose a tax, assessment charge or fee or specifically increase a then existing tax assessment, charge or fee, which Landlord shall be required to pay, either by way of substituting for said real estate taxes or assessed against the Building, or in addition thereto, or impose an income or franchise tax or tax on rents in substitution for a general tax levied against the Building or in addition thereto, such taxes, assessments, charges or fees shall be deemed to constitute a real property tax hereunder to the extent said taxes are in substitution therefore or in addition thereto. A copy of the actual tax bills or assessment bills submitted by Landlord to Tenant shall at all times be sufficient evidence of the amount of taxes and/or assessments levied or assessed against the property to which such bill relates. 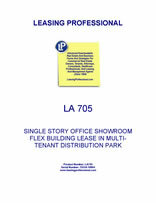 Landlord's reasonable expenditures for attorney's fees, appraiser's fees, consultant's fees and other costs incurred during the Term of this Lease without regard to the tax year involved, in any efforts by Landlord to minimize ad valorem personal and real property taxes, and other governmental charges, which rights are reserved to Landlord, shall be included in the definition of ad valorem real and personal property taxes and other governmental charges for the purposes of this Section. If Landlord should receive a refund of any such taxes or charges, the Tenant will share proportionately in same, after deduction for all of Landlord's expenses in obtaining any such refund. Landlord's and Tenant's obligations under this Section shall survive the expiration of the Term of this Lease. The term "Direct Expense" shall not include any income tax of Landlord, any depreciation on the Building or any depreciation on equipment therein, interest, or real estate broker's commission for any sale or for securing the execution of any Lease. Tenant shall further pay as Additional Rent any sales or use tax imposed on rents due from Tenant (other than City, State or Federal Income Tax), and to the fullest extent lawful; any tax or rents in lieu of ad valorem taxes on the Building, even though laws imposing such taxes attempt to require Landlord to pay the same.